Sucker Punch's Ghost of Tsushima looks like a complete change of pace for the studio that brought us the Infamous series, swapping electrical superheroes for an action-adventure stealth game set in sweeping Japanese landscapes and historical conflict. You'll play as samurai Jin Saka, a lone warrior in 13th century Japan who will learn "the way of the Ghost" to battle Mongol invaders. "In Infamous you explore powers. In this game, we let you explore what it is to be a samurai inside of this enormous landscape of medieval Japan," says creative director Nate Fox of Ghost of Tsushima. Jin Saka has a katana, a grappling hook, and a faithful horse to help him, but taking on one of the most intimidating armies in history is still guaranteed to be a challenge. The game doesn't have a release date yet, but here is every we do know about PlayStation exclusive Ghost of Tsushima. To tell a good samurai story, you first need a good samurai. Protagonist Jin Sakai is one of the last line of defenses against the Mongol hordes that are invading Tsushima - but fortunately, he's got katana skills befitting a one-man army. Rather than some ornate armor, Jin prefers to wear a straw raincoat to better insulate himself from the rain and winds. His red attire mirrors the red leaves that swirl and drift around the island (and feature prominently in the gameplay trailer). Of course, Jin can't possibly fight off the Mongol army on his own. He has to gather allies - like Masako, the skilled archer who features prominently in the gameplay debut. Her allegiance with Jin goes south when he protects the monk that she wants revenge on, resulting in a duel even as the enemy forces approach. Clearly, recruiting the people of Tsushima to fight by your side won't be easy - but it's ultimately necessary. As you probably already guessed, Jin is a master of the sword - and there will be plenty of melee combat as you cut through the Mongol invaders and their many scouting parties. From what we've seen, the skirmishes focus on the art of the counterattack, with Jin patiently waiting for his opponents to charge him before deflecting their strikes and slicing them for the kill. When it's you against many, you'll need to properly time your counters to ward off all types of weapons, including swords, spears, and shield slams. There are also stealth segments (which give off serious Tenchu vibes), where you can get the jump on a group of enemies and trigger a time-slowing targeting system that lets Jin execute multiple foes in quick succession. To help you reach better ambushing spots, Jin has a grappling hook to quickly scale structures. He can even throw it out mid-jump, much like Nathan Drake's acrobatic grappling in Uncharted 4. Sucker Punch’s new game moves away from the industrial cities of the inFamous series in favour of Feudal Japan. It’s the year 1274, and you’re on the titular island of Tsushima, Japan. And as you can see from the gameplay trailer up top, it’s rather stunning. You play as one of the last surviving samurai warriors, and 1274 just happens to be the year the Mongol Empire invades the island of Tsushima. So it’s time to get your samurai on and fight to protect your homeland. "When we hit upon the Mongol invasion of Tsushima of 1274, it all clicked," explains Nate Fox, Game Director at Sucker Punch. "Suddenly you knew who the heroes were, who the villains were, what the stakes were for the world, and you had a video game." The decision to stay open world, following on from Sucker Punch's success with inFamous, was apparently clear from the start. "We wanted to stay open world, because we're giving authority and power to the player," says Fox. "We didn't want to want away from that. We think its integral to modern gaming that players are in charge." "All of what’s shown in our debut trailer was captured in our game engine, that’s the interactive world we’re painstakingly crafting together, that’s the world we’re going to set on fire," adds Fox. "The artists and engineers here at Sucker Punch have brought this world to life on PlayStation 4, from tall grass blowing in the wind to the call of a far off crane, we want to make it feel real." According to Sucker Punch the action will all take place on a "huge island filled with a lot of different places, towns, people." Apparently as the last samurai, you’re going to have to abandon your honorable tactics of old to forge a new way of fighting - literally, the 'Way of the Ghost'. Aaah, that explains that title then. The reveal trailer shows off just some of the weapons and gameplay features, including katanas, longbows, and armored horses. "We’re excited to finally be able to talk about the game and look forward to sharing more in the coming months," says Fox. "Keeping it a secret for so long has been painful. The trailer is the perfect way to share with the world what we’ve been dying to play for so many years - fighting back invaders in feudal Japan, mastering the katana and building your legend as ‘the Ghost’." A recent job listing in April 2019 - spotted on game industry insider site Gamasutra - suggested Sucker Punch is still hiring for a narrative writer on the project. While we can only speculate, it does suggest that the team is still hard at work on campaign content for the epic adventure, rather than making final touches and adding a bit of polish. Could Ghost of Tsushima end up being a Sony PS5 title? We'll have to wait and see. Until then we’ll be updating this page with everything we discover about the game, from gameplay details, new trailers and fresh news. 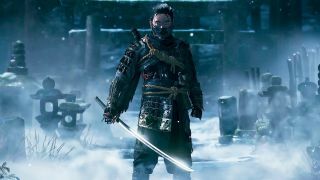 Ghost of Tsushima dev says Assassin's Creed in feudal Japan would've been studio's "worst nightmare"